The internet, digital media and big data induced an explosion of the need for data storage capacity and unfortunately, with the data capacity, also an exponential growth of its energy consumption. Optical information storage is a promising approach to reduce energy requirements, but no successor to the "Blu-ray Disc" - state-of-the-art for almost 20 years - is in sight. We combine concepts of nanotechnology, photonics and artificial intelligence to increase storage density below the optical diffraction limit, the latter being the main physical challenge in going beyond the Blu-ray Disc. With the exploding amount of generated and transferred data through the internet and the accelerated mass-market availability of connected devices like smartphones, large scale digital information storage is one of the major technological challenges of our society in the near future. In the times of ultra-HD video streaming and "big data", the necessary data center capacity is growing at an exponential pace (see Fig. 1). In consequence, information storage is no longer only an issue of available capacity, but energy consumption and hence the environmental impact have long since become a major problem. Optical information storage holds the promise to significantly reduce energy consumption, since energy is consumed only during writing or reading of data and the storage media provide at least one order of magnitude greater longevity. By outsourcing in particular data for long-term storage to facilities employing optical solutions, the energy needs of data centers could be significantly reduced (energy consumption only during read/write access; no replacements of storage media needed). Already in the short term (2-5 years) power-savings in the order of 80% can be achieved and for very long storage periods of 100 years and more, the energy savings could even exceed 99% compared to classical storage technology . Figure 1: Left: Worldwide information generated each year. Right: Lifteime of optical (OSA) vs magnetic (HDD) storage media and achievable energy savings for applications in data centers. Adapted with permission from . This is all the more unfortunate, as for now almost 20 years, no new generation of optical storage medium has been brought to market maturity. The state-of-the-art "Blu-Ray Disc" has been introduced around the year 2000. The Blu-Ray Disc, as well as its predecessors, the CD and the DVD, suffer from a major physical limitation: with standard optics, light cannot be focused to indefinitely small areas. The smallest possible focal spot is of about half the size of the light's optical wavelength. As illustrated in figure 2, the diffraction limit represents a physical boundary to the achievable information density. 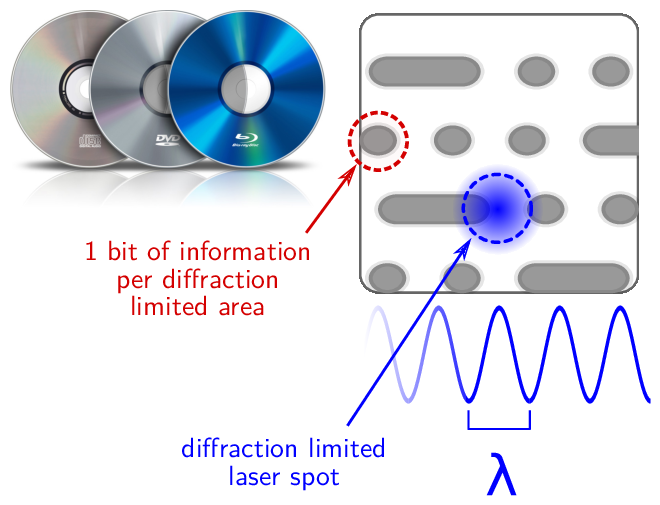 Figure 2: Classical optical information storage media like the DVD and Blu-ray Disc are based on encoding and reading a single bit of information per diffraction limited area. 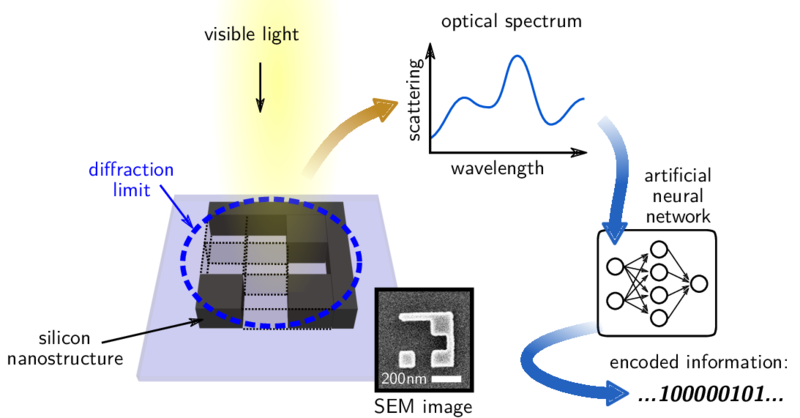 Our first key idea to overcome this limitation is to use silicon nanostructures and exploit their unique optical response over a broad spectral region for information encoding. While it is impossible to spatially resolve features below the diffraction limit from the optical far-field, deeply sub-wavelength geometric features can still have a strong impact on the optical scattering and therefore it is possible to observe their presence spectrally. As illustrated in figure 3, we design silicon nanostructures encoding up to 9 bits of digital information. Attention is spent in the design of the geometries, such that every structure encoding a specific bit-sequence possesses a unique scattering signature. From the measured optical response, the encoded binary data can then be retrieved. Figure 3: Our approach uses silicon nanostructures to encode multiple bits per diffraction limited area. The readout of the encoded information is based on analysis of the scattering spectra via a deep artificial neural network. Unfortunately, the identification of the bit-sequences based on the scattering spectra becomes very difficult in realistic cases with structural defects and noisy measurements. The second key idea for the approach is therefore, to train a deep artificial neural network on the read-out of the encoded information via the optical spectra. We demonstrated, that using the combination of spectral scattering measurements and deep learning allows to encode and retrieve up to 9 bits of information from a diffraction limited area, effectively going beyond the information density of the Blu-ray. Our results, published recently in *Nature Nanotechnology* , pave the way towards a next-generation optical storage concept with the potential to increase the information density by at least an order of magnitude.